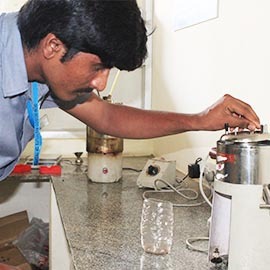 The Fluid Mechanics and Machinery Laboratory is to provide a variety of laboratory learning activities that are related to fluid mechanics, aerodynamics and fluid machinery. This laboratory consists of several experimental setups for verifying the basic laws of fluid mechanics and some flow measuring devices. This lab houses experimental setups of a pelton wheel and a Kaplan turbine which facilitate the study and performance test of turbines. Experimental setups for several pumps also serve the same. It also serves the needs of the industries through consultancy services. Examples of consultancy services are performance test of centrifugal pump, submersible pump, turbine pump, fan performance test etc. It houses a large pump testing rig to serve these purposes. 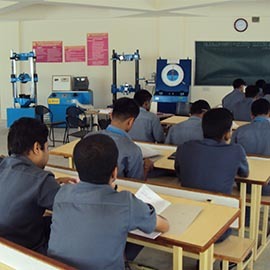 The Fluid Mechanics and Machinery Laboratory is equipped with piping systems, Orifice Plate meter, Nozzle, Venturimeter, V-notch, Pelton wheel, Kaplan Turbine, Francis turbine, single/multistage reciprocating pumps, compressors, air blowers etc. This lab facilitate analyzing friction, different types of loses in piping arrangement and the forces acting on the different types of vanes and calibration of different types devices. Also facilitate performance tests on turbines. By end of the course the students are able to analyze different types of forces due to fluid and performance tests on varieties of turbines, pumps and air blowers.